The enjoyment of fundamental freedoms is severely constrained in Mauritania as conservative religious values and overarching dominance of the state in public affairs combines to restrict people’s rights to associate, protest and speak out. Groups combating slavery and human trafficking in Mauritania face persecution, as Boubacar Messaoud, president of SOS Esclaves, one of Mauritania's oldest anti-slavery groups told Thomson Reuters: "The repression is getting worse and worse". A February 2018 Human Rights Watch (HRW) report based on research in 2017 contains worrying findings and shows how the Mauritanian government has cracked down on organisations that strive to address pressing "issues of ethnic and caste discrimination, slavery and its legacy, and grave abuses of the past that targeted particular ethnic groups". Authorities have claimed there is no repression of NGO activities; however, HRW documented cases that reveal otherwise. The report also details the repercussions of the country's 1964 Law on Associations, which gives the Ministry of Interior control over the authorisation and legalisation of associations and organisations. A 2016 draft law that could replace the 1964 law would reportedly not improve the situation for civil society organisations in Mauritania. "The repression is getting worse and worse". The repression includes denial by the state of authorisation for groups' events and activities to take place. According to activists on the ground, such refusals from the authorities occur frequently, hindering NGOs' abilities to conduct outreach, awareness-raising, training, and to provide services to victims. Though slavery was officially abolished in Mauritania in 1981, the problem persists and activists speaking out against this human rights violation face persecution and judicial harassment. At the time of writing, two anti-slavery activists with IRA-Mauritania, Moussa Bilal Biram and Abdellahi Matalla Saleck, remain in detention, imprisoned for over a year in a remote location in the Sahara desert. 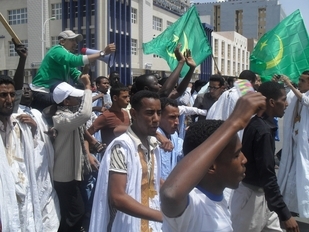 Other members of IRA-Mauritania were also arrested and imprisoned, along with the Biram and Saleck, for allegedly participating in a 2016 protest, though none of the members were reported to have been at that event. The authorities have nonetheless pressed charges of "incitement of a non-armed assembly with the goal of threatening public order". Human rights groups, such as Amnesty International and Front Line Defenders, have called for the activists' immediate release. On 27th April 2018, Mauritania's National Assembly passed a law on “blasphemous speech” and “sacrilegious acts”, which could broaden the scope of cases in which the death penalty could be applied. According to Human Rights Watch (HRW), the new law appears to be connected to the case of Mohamed Cheikh Ould Mkhaïtir, a blogger who remains incommunicado detention for "apostasy" because he spoke out online "denouncing the use of religion to legitimize discriminatory practices against the blacksmith caste in Mauritania with which he identifies". There are serious and genuine concerns that the recently-passed law could be applied to the blogger's case, as he remains imprisoned despite fulfilling his initial sentence. Along with HRW, other international organisations have called for the law to be repealed, and ultimately, the death penalty to be abolished. NGOs and human rights defenders in Mauritania work in extremely difficult circumstances and face significant risks when promoting rights or the protection of vulnerable groups. NGOs and human rights defenders in Mauritania work in extremely difficult circumstances and face significant risks when promoting rights or the protection of vulnerable groups. NGOs are mandated by law to register but registration is sometimes denied, leaving them with no choice but to operate illegally. In 2016, UN Rapporteurs jointly criticised a draft law on civil society, calling on the authorities to remove the law from the legislative process because adequate consultations had not been undertaken and because the law created unnecessarily burdensome requirements on CSOs and gave overly broad powers of dissolution to the authorities. Slavery is a particularly serious issue in Mauritania, where the practice continues despite a 1981 decree and a 2016 law designating slavery a crime against humanity. Anti-slavery movements and activists face routine arrests and harassment as a direct result of their advocacy. Many activists belonging to the Initiative for the Resurgence of the Abolitionist (IRA) Movement in Mauritania have been jailed, and the government does not recognise the movement. The IRA has been waiting for registration for five years. In January 2015, three anti-slavery activists Brahim Bilal Ramdane, Djiby Sow and Biram Dah Abeid were sentenced to two years imprisonment for belonging to an unrecognised organisation. In a positive development, ten IRA activists were released from prison in November 2016. There is no legislation to protect human rights defenders in the country. Those who report human rights violations receive death threats, intimidation and are blackmailed. Other non-state actors, such as religious leaders, openly call for attacks on human rights defenders. In 2014, the head of an Islamist organisation threatened human rights defender Aminetou Mint El-Moctar calling for her eyes to be “gouged out” and offering a reward for her killing. The police refused to grant her protection. In prison, activists, and other prisoners face methods of torture including electric shocks in order to extract information from them. Jailed activists are also denied access to medical care. The same methods are also used on suspected homosexuals. In 2014, the government closed several Muslim education and charity organisations. Their offices were sealed without explanation. Workers may organise, but their gatherings are met with much hostility. Although Article 10 of the Constitution provides for the right to freedom of peaceful assembly, peaceful protests are often violently disrupted and protestors attacked. Although Article 10 of the constitution provides for the right to freedom of peaceful assembly, peaceful protests are often violently disrupted and protestors attacked. Protestors also need permission for large gatherings, something which is often denied by the authorities. In November 2014, three activists were arrested for staging an anti-slavery roadshow aimed at increasing public awareness on slavery and land rights. Among a litany of charges, the activists were charged with incitement of violence and disturbing public order. This typifies a context in which protestors are sometimes arrested and even sentenced on unspecified charges. In 2013, five activists belonging to the IRA were arrested and charged with taking part in an unlawful assembly. Their arrest related to protests held in solidarity with an 18-year-old girl held as a slave from the age of four. Also in 2013, youth protestors were beaten up at a protest calling for citizens to boycott elections. Protests and solidarity initiatives organised to demand the release of arrested IRA leaders were crushed in 2015. Free expression is guaranteed by the law but routinely violated in practice. Free expression is guaranteed by the law but routinely violated in practice. In 2010, the state was praised for granting licenses to two private television stations and five radio stations, effectively ending 51 years of a state monopoly on broadcasting. In reality, however, the state retains significant control over public narratives, and newspapers can be closed for publishing information that is deemed by the state to threaten security. Journalists also practise self-censorship, especially on matters of slavery, religion and military matters. Defamation was decriminalised in 2011 but hefty fines remain. The internet is not restricted but certain online content can attract serious punishment. In 2014, blogger and freelance journalist Mohamed Cheikh Mohamed was sentenced to death for a post criticising conservative religious beliefs. Having appealed his sentence, the appeals court rejected his application, while his lawyer abandoned his case and his family disowned him. Journalists are also routinely questioned by the authorities. In April 2015, the editor of the online newspaper Al-Bayan El-Souhoufi was summoned to explain an article on strained relations between Mauritania and Morocco. In 2014, a news manager was detained for days and his family denied access to him after he tried to hand over a file to the President during a public event.